Ask fellow campers about "Holiday RV Park" and nearby attractions. We have stayed at this park several times and reviewed it as well. 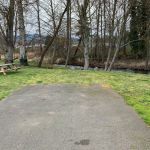 It is an older park that could use some maintenance on the site and roadway pavement. That said it still works fine and even in the heavy rain we experienced only a few sites were covered in water. The issue we had was the services are very close to the front of the pull-through sites which means you need long cables and hoses or move your unit to the front and park behind. This really defeats the purpose of a pull through. We will continue to stay here however, as the welcoming staff and easy access to I5 make it the perfect location to tackle the Siskiyou pass in winter. We camped at Holiday RV Park in a Travel Trailer. We had a long pull-through site that was asphalt. Some grass but also a lot of dirt that got muddy. There was plenty of room for slide-outs but sites were close enough that our picnic table was close to our neighbor's hook-ups. Very clean laundry facilities. The machines were older but in good working order. There was even an iron & ironing board. Many people here appear to be long term residents but most RVs were well taken care of. The person who checked us in was friendly & helpful. This RV park is very close to the interstate but was surprisingly quiet. Trees & a large building & shopping center help block any traffic noise. 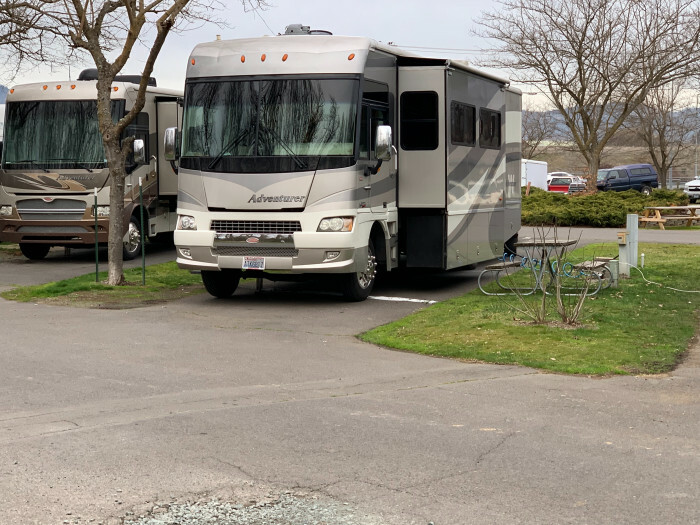 We camped at Holiday RV Park in a Fifth Wheel. Across the interstate there is a Petro station & an associated Shell which, when we were here, were by far the cheapest in the area. The park was difficult to negotiate with a large motorhome and tow car. It is an older park with limited space. The staff was friendly and competent. The entrance was a little difficult find in behind a strip mall. We camped at Holiday RV Park in a Motorhome. Our site was level so it didn't require blocking and it was paved. Also, the neighbor (who was one of approximately 30% who are long-term residents) was very friendly. The park is located walking distance from a beautiful greenbelt running by Bear Creek and is near a shopping center with a Rays, a Chevron and a Dutch Brothers. The location is also convenient to Medford and many local wineries and Oregon Shakespeare Festival (in Ashland) and quite a few local hiking trails. The restroom facilities when we were there appeared to have been recently renovated and were very clean. The one negative to the park is the limited staffing. We stayed an extra day there, but had difficulties with the limited hours that we could contact someone on the staff to confirm the extension. Staff hours (I believe) were only 10AM to 5PM during which time we were out and about. We camped at Holiday RV Park in a Travel Trailer. Lots of wine tasting, shopping (both locally and in Medford) and hiking trails. Also, the location is not far from Ashland (Oregon Shakespeare Festival), Talent and other entertainment venues. We happened to be able to take in a guitar concert at SOU during our stay. We stayed @ this park several years ago and it is still a great overnight spot when heading north or south on I5. The access from the I5 in either direction is easy. The park is just far enough from I5 that traffic noise should not be a problem especially if you get a site toward the south end. The site are mostly pull through and should be long enough for most. The WIFI is great and with many towers seems to be fast even in the evening when lots of people would be on it. We would stay again if in the area. We camped at Holiday RV Park in a Travel Trailer. Be careful getting to the park from the south-the off ramp has changed and requires a quick lane change to make the entrance. We called ahead to request a spot. We were assigned one sight unseen and drove to it to find a short parking space with a tiny dirt area with a tiny picnic table. The utilities for the next space were practically under our table. Our utilites were under the other neighbors'. Our slot was too short to park our 17ft trailer and car together. We were too stupid to request a better spot but we did see some along the creek that would have been nice with grass areas. As others have said there are a lot of permanent residents. Some came and went early and late in noisy vehicles. We did not use the pool, restrooms or laundromat areas. The lady at the desk was nice but I feel we should have been offered a choice of spots and not assigned a tiny, extra short, dust hole when nicer places were available. Beware, you are right near the I-5 which is convenient but noisy. We camped at Holiday RV Park in a Travel Trailer. The office staff were very helpful and courteous. Had candy and cookies! The bathrooms are clean and spacious. The problem is with the sites: the space between sites is just a patch of dry grass; lots of cobwebs everywhere; the trash dumpster was full when we arrived and two days letter it had not been emptied, with trash bags overflowing and some on the ground because there was no more space in the dumpster. It appears that people live there permanently and their sites are very unsightly. The roads are narrow and people park perpendicular to their rigs, so it makes difficult to get out of your spot while towing. The picnic table was so old and full of cobwebs that we did not use it at all. We will try to avoid staying here again. We camped at Holiday RV Park in a Travel Trailer. 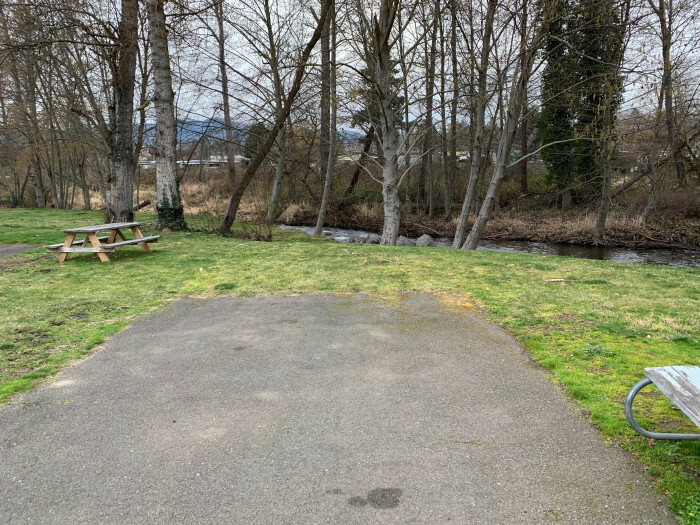 This park is right off I 5, and about the only place to stay if you want to go to the plays in Ashland. There are a lot of full time residents, which is not a plus in my mind. Our site was a pull through facing the creek. There are several large trees which makes getting satellite reception difficult. They really need to repave the roads and update the sites with new picnic tables. There was just dirt between the sites. We camped at Holiday RV Park in a Motorhome. Set up satellite before setting up your site. 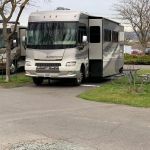 My husband and I were traveling from central California and found Holiday RV Park to spend the night. Our site was right by Bear Creek, what a beautiful view! We also went into the swimming pool, which was really nice! We had an end site, so we had lots of room and loved it! I would recommend this place to anyone traveling near Phoenix, Oregon! We camped at Holiday RV Park in a Motorhome. Way too many permanent residents, probably 80% of the spaces. They all have too many vehicles which makes navigation in the park trecherous. It's bad enough when there are no extra vehicles to dodge. This park should be about $28.00 a night. I can see no justification for a charge of over $40 a night. Spaces are tight and roads are narrow and multi-directional as well. Have stayed here several times over the years and each year this park has declined in some way. Maintenance is also lacking. The 30Amp receptacle in the power stanchion at our site was totally burned out. Had to buy 50 to 30 adaptor to use this site. This will be our last visit here. We camped at Holiday RV Park in a Travel Trailer. Decent park for an overnighter, but that's about it. Roads are tight and cramped with other vehicles, but doable. Sites are extremely narrow, very close together; in fact, so close forget about putting your awning out all the way. Tons of permanent residents. Owners need to have them clean up their sites a bit. Water pressure up the kazoo, so make sure you attach a pressure regulator. Some road noise from I-5 and adjoining businesses. Overpriced for sure. We camped at Holiday RV Park in a Fifth Wheel. Very nice and clean. Close to everything-wineries, crater lake, shopping, Shakespeare festival. We camped at Holiday RV Park in a Motorhome. It's paved with strips of dead weeds separating our motorhomes. Really jammed together,, no privacy, very noisy with cars running through very fast all night long. The bathrooms are run down as is most of this older unkempt site. Bear Creek runs along side the park, but talking with a few of the locals who live there say don't touch the water if you have any open wounds or let your dog go near it, very toxic with animal feces and mercury. We camped at Holiday RV Park in a Motorhome. Right off I-5, but noise wasn't bad. Sites are paved, level, nice and wide. Little privacy between sites. Park was clean and well manicured. Didn't use facilities -- showers were 25 cents for 8 minutes -- what!!? WiFi was very poor, frustrating to use. We camped at Holiday RV Park in a Motorhome. Park was very busy in July -- advanced reservations recommended. McDonalds next door and nice restaurants in adjacent shopping outlet shop area. Wal-Mart and Fred Meyer stores within 3 miles. Harry and David is just up the road in Medford, and it's a neat place to tour, besides buying delicious food. We come here usually once a year for the Shakespeare Festival in nearby Ashland. Other local sport to visit are the Harry & David facility in Medford or the historic downtown in nearby Jacksonville. Are you affiliated with Holiday RV Park ?